Welcome to the incredibly cool iPhone app from NextMovie. Like NextMovie -- the new movie site from MTV Networks -- this app will be your go-to destination for news, features and info on the movies and stars you love. Our app is as fun as it is easy to use. It updates all the time. And, of course, it goes wherever you do. - UpNext: Fresh every weekday, UpNext delivers our picks for the coolest stuff to in the world of movies, from new releases to Blu-rays, from toys to viral videos and beyond. - Latest News: If it's happening in movies, NextMovie has the story. - Movie Features: Get star interviews, hot celeb photo galleries, our NextMovie Nine countdowns and much more. - NextMovie Daily (video): Press 'play' for the fastest 60 seconds in Hollywood. Hosts Nar and McKenna spotlight the day's biggest stories as only they can. - Share the wealth with your friends on Facebook. So what are you waiting for? 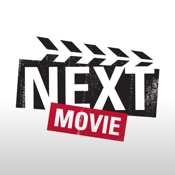 Download the NextMovie app now. It's free, it's fun, and it just might save your life -- or, at least, those two hours you might've spent sitting through the wrong movie.